Period of creation 2003-11-14 to 16. These intervals result in the tone material b – c – d flat – e flat – e – g sharp, which symbolises love (“if”-/”but”-clauses of the recitative, complete aria). The remaining tone material (d – f – f sharp – g – a – b flat) is used for the pas­sa­ges of missing love (concluding clauses) as well as for the objections by Erich Fried’s poem. These objections as counterpart to the love should be executed devilishly by the preferably male pianist. The recitative with a double three-parted biblical text and the objections by Erich Fried’s poem is a fight for love which results in quick changes between different moods as well as between different degrees of tonality and atonality (within the given tone material). 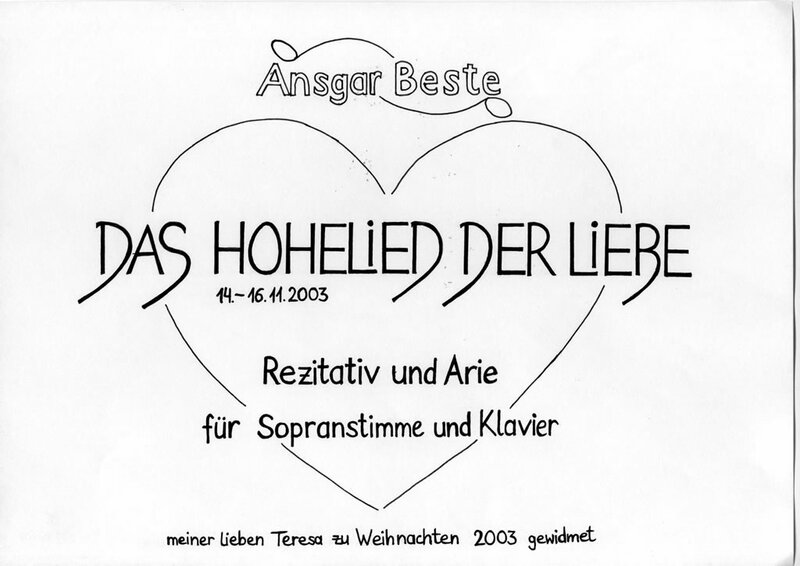 The aria with its non-stop ostinato accompaniment represents the achieved goal (of the fight in the recitative) which stands for the reliability and the inner peace of love. The basically tender dynamics and the free tonality express its gentleness and its strong but internalised emotionality, but also its fragility. Only the negated characteristics of love still appear in a rather gruff manner. The fading of the accompanying ostinato at the end are supposed to make the listener reflect the reliability of his own personal relationships.